Our vacation this year was “Colorado” (another installment in our “See America” series) and Great Sand Dunes National Park was one of the locations we visited. I researched this location rather extensively before departing so that I knew the approximate location I wanted to be at the correct time to get the desired angle of sunlight (in this case ~5p-6p). The weather was great (temp ~74°F/23°C, very slight haze) and due to our status as empty nesters, we were there at the close of the season after most schools in the US had started their new year, so we had very little in the way of crowds to get in the way. We hiked south for a mile or so, then my friend and I left our wives behind and turned west to start our climb up the ~700ft/213m sand dunes. The good news was that we were indeed all alone on the dunes in this area. The bad news was the dunes were 700 feet high piles of loosely packed sand. Put a foot down, it would slide back about 1/3 of your normal step, rinse and repeat. Oh, and the base of the dunes is over 7500ft/2280m, so for us East Coast flat-landers, it was a grueling hike. But the payoff at the summit was worth every ounce of effort. Now all I had to do was capture that beauty. 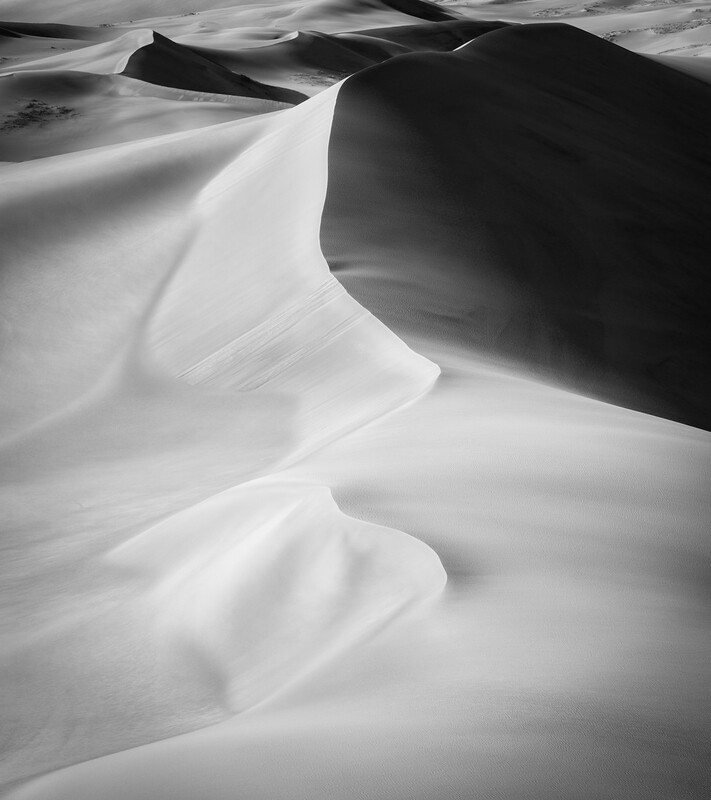 Here is one of my images highlighting a nice set of side-lit dunes (part of the 30 square miles comprising the highest dune field in North America). While I think this photo is satisfying and I rather appreciate the tonality I was able to extract (particularly with the help of Nik Color Efex), I still thought it was too…busy. 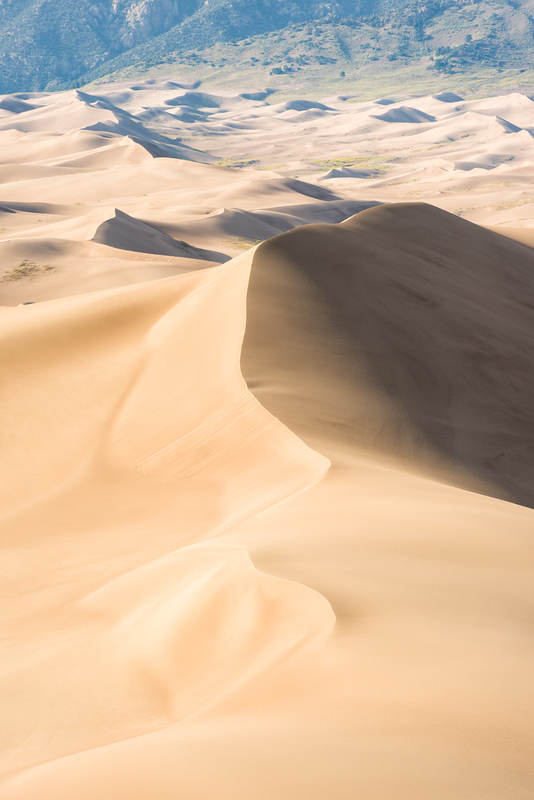 ​​Crop in tighter to the main element – the arabesque dune in the lower center. Use Lightroom’s HSL panel to convert to monochrome. Adjust the color sliders to achieve the contrast and tonality desired. Gradient filter on the upper left to pull down the exposure a bit. Just a touch of post-crop vignette. I think this is a much stronger image. It also demonstrates that B&W can be a wonderful way to capture the beauty of a scene.